This is a dish I grew up with, that is very popular in Brazil, where it is known as” Bacalhoada.” There are many variations of this dish. It is originally made using salted cod, however due to difficulty finding salted cod in Texas and Arizona, where I’ve lived in the United States, I had to change the recipe using fresh or frozen cod. Although salted cod is a key ingredient, this recipe with still gives you a good taste of this wonderful Portuguese dish and reminds me of Brazil. It is ” chic” but easy to prepare. Arrange cod fillets in a platter and squeeze lime juice over them and sprinkle salt and pepper to taste, then set aside. Cut potatoes in thin slices and cook them in boiling water for 10 minutes, until tender. Drain water and arrange slices in a large glass or ceramic baking dish (I use a 9.5×13). Drizzle olive oil and sprinkle salt and pepper. Cut zucchinis in thin slices and arrange half of them on top of potatoes, drizzle olive oil and salt and pepper. Cut tomatoes in thin slices and arrange half of them on top of zucchinis, drizzle olive oil, salt and pepper and half of the drid basil. Arrange cod fillets on top drizzle olive oil , salt and pepper. 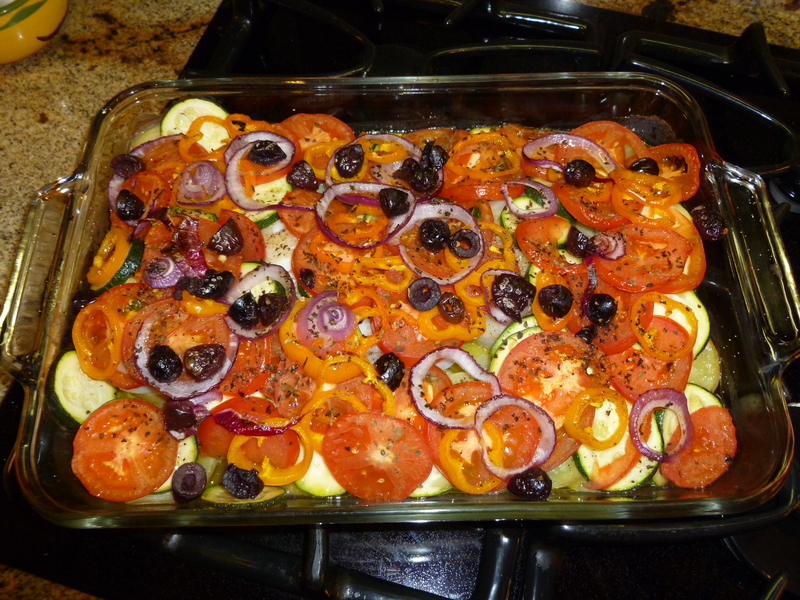 Arrange the remaining zucchini and tomato slices on top. Again drizzle olive oil, the rest of dry basil, salt and pepper. Cut bell pepper and onion in thin slices and arrange them on top. Garnish with olives and drizzle more olive oil salt an pepper. Cover with foil and bake for 30 min. Remove cover, and leave casserole in the oven for another 10 minutes. Serve on top of white steamed rice. This a large dish perfect for a dinner party since it serves 8 people. Reduce recipe to half if making for less people. Bom Apetite! This looks delicious! I will definitely be making this dish. Thank You, Mamma Sera. Hi Lu! I found your blog & joined wordpress. Your posts make my mouth water. Thank you! Enjoy, it’s easy yo make.